consists of the introduction of multiple passes of high energy impacts at the ground surface by repeatedly dropping steel tampers generally ranging from 6 to 20 tons from drop heights ranging from 30 to 60 feet. The high energy impact creates a shock wave that densifies the soil at depth and reduces the void ratio; thus improving the consistency and overall engineering properties of the soil mass. In doing so, the need for off-site removal of the existing soils for replacement with compacted granular fill or the installation of deep foundations which bypass the loose soils can be eliminated. The tamper used in the dynamic compaction process generally results in craters on the order of six feet in diameter and ranging in depth from two to six feet. Following each pass, the craters are backfilled. If suitable, surrounding material can be pushed into the craters, resulting in an overall lowering of the site grade. 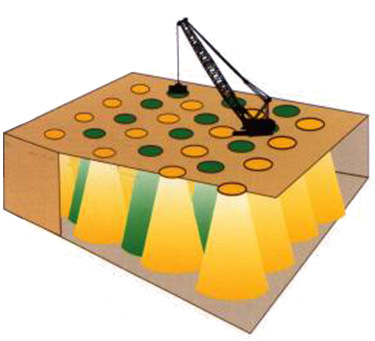 If not, then imported granular material must be used to backfill the craters in between passes. In addition to strengthening and compacting the existing fill or natural soils, dynamic compaction is similar to proof-rolling in that it exposes pockets of softer material or materials that are unsuitable to provide foundation support or to construct finished hardscape features upon. These areas, when identified during compaction, can be remediated in one of two ways; either additional pounding can be carried out until the soils are adequately densified, or the soils can be undercut and replaced with compacted fill. The degree and depth of soil improvement achieved with dynamic compaction depends upon the total amount of energy applied to the soil; i.e., the more energy imparted to the soil, the greater the degree of improvement. Depth of improvement is a function of the amount of weight being dropped and the drop height, with improvement depths of 15 to 25 feet commonly being achieved. 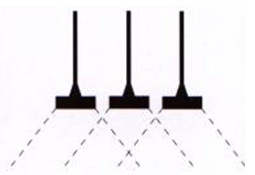 Dynamic compaction is typically performed over a predetermined grid pattern, with multiple passes being implemented on offsetting grids. The grid spacing, number of drops per impact point, drop height, and total number of passes is dependent on the site-specific soil conditions, the observed ground response, and the dissipation of pore water pressure subsequent to pounding. Comprehensive monitoring of ground response is needed to control the work, and allow for modification to the program being implemented. The applied energy, impact grid, and the sequence and timing of the drops can all be adjusted, as needed, to achieve the desired results.